Small space, large quantity. Clever solution! Reliability in every application remains the key criterion for cable carriers. And that is exactly where you can rely on KABELTRAX. 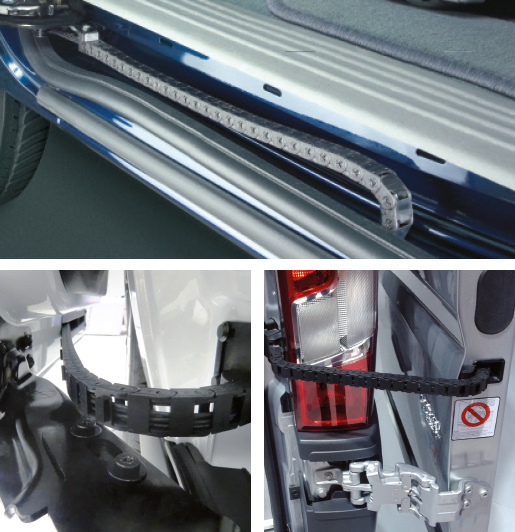 Whether it is an automotive or another technical application with a tight installation space combined with the requirement for an extended service life and aging ­resistance: KABELTRAX creates solutions. Take advantage of our standardized solutions for highly complex requirements – developed by years of optimization and therefore particularly suitable for tight spaces. Proven a million times over and used in ever new areas of application such as in the vending machine industry. Manufactured and assembled in 24/7 production for decades. That means: High capacities and a continuous zero-defect quality in ­manufacturing equal parts. And for particularly tricky customer demands: ­KABELTRAX engineering is happy to accept the challenge. With ­intelligent use of technical possibilities, we work in close cooperation with customers to develop their individual ­products. From the first development steps to a smooth series production process. Additional engineering services such as installation space analyses, feasibility studies, validation tests and project management complete our range of services. Simply a reliable development partner. You have a fully developed solution and are looking for the right partner for implementation? KABELTRAX is happy to provide its expertise in the field of development as well as in manufacturing to achieve the best possible production result.